Earlier this week I attended an event in Leeds to celebrate 25 years of education at Leeds Business School. As an alumnus of the public relations and communications degree course, it was an opportunity to speak to a broad range of practitioners who had completed a variation of the course taught there since its inception in the early 1990s, as well as academics, and current students at the university. 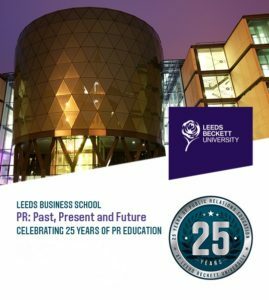 It was also an opportunity to reflect on the value of PR education, academia, and the contribution that Leeds Business School has made to the wider industry, in Leeds, nationally, and internationally. The variety of roles held by attendees, and the continuing success of the Exploring Public Relations textbook, authored by two of the university’s leading academics are fitting testaments to that. While the day was a celebration of a significant milestone for the business school and the PR course team, a gathering of public relations thinkers and do-ers also prompted a number of debates on how communications has evolved in the past 25 years, and on the key issues affecting current PR practice today. I’ve written previously about the profound impact technology can and will have on the business of communications, and big data and machine learning will undoubtedly be one of the many areas of technology that have a significant influence. To that end the University’s Professor Ralph Tench talked through some of the findings of the European Communication Monitor, which found that 72% of European communicators believe big data will change their profession, with almost a quarter of the European communications professionals surveyed citing it as one of the three most important issues for communications management in the near future. It comes as no surprise to me, and many others in the industry, that these technologies will change how we do what do. However, it remains to be seen how well the communications industry will keep up with the ever-increasing pace of change we’re seeing brought about by emerging technologies. I’ll spare you a long read on this – you can access the research findings on the website and in the deck embedded below – however, technology plays a key role in something we discussed later in the day – fake news, both in enabling its creation and proliferation, and in combatting it. A panel of experts from lecturers, former journalists, and communications professionals explored the current phenomenon of fake news. While panel and audience members didn’t always agree on everything there was a consensus that fake news was not new, it is something that has been around for many years. What has changed is its prevalence, its aims and objectives (that are becoming increasingly sinister) and the relative proportions of different categories of fake news. These can range from presenting information with false connections and contexts, to completely fabricated and deliberate falsehoods that are designed to propagate the illusion of conspiracy and influence decision-making by those less adept at critical assessment of the information presented to them. As communicators we have a role to play in calling out these falsehoods and lies. We’ve seen the impact maliciously created content can have on reputation and markets, with dramatic shifts in market cap and trading volumes directly correlating to false news reports. There are issues of how we can act, when we should act, and in some cases should action be taken at all, lest that action draw attention to some false information that could have a material impact on the reputation of our company or client. The debate was wide-ranging, and I was fascinated by just how many different viewpoints there were in the room. There was however a consensus that more needed to be done, and that a collaborative efforts from all involved in the content creation and consumption ecosystem should be party to that effort, from journalists and communicators, through to search engines and social platforms. Among the industry figures in attendance were current CIPR President, Jason MacKenzie and InterContinental Hotels Group’s EVP, Global Corporate Affairs Yasmin Diamond who gave a fascinating keynote on what she has learnt in her extremely diverse career, with senior communications roles in the NHS, Whitehall, and her current role in the hospitality and leisure industry. Yasmin’s talk was incredibly interesting and insightful, covering her time as a Whitehall Director of Communications under three different Prime Ministers, her current role, and the different challenges that presented themselves along the way – from campaigns tackling youth knife crime, to communicating in China, where not only the language and culture is different but the media landscape and consumption of news is radically different to what we know here in the UK. The advice she shared resonated with all, highlighting the importance of speaking truth to power – noting that a financial director wouldn’t not tell a CEO about a big hole in their budget, so why should communications professionals remain silent on significant risks to reputation. Yasmin also used the quote often attributed to Epictetus: “We have two ears and one mouth so we can listen twice as much as we speak”, encouraging current students and PR professionals early in their careers to be curious, advocating Dale Carnegie’s “be interested, to be interesting” mantra – saying that curiosity and interest allows communicators to develop better content and tell more compelling stories. She managed to pitch her keynote perfectly, something incredibly difficult to do with such a diverse audience. However, on speaking to many of those in attendance later that day, no one felt it was too simple for them, nor did I find anyone who felt it was over their head – even those with little to no experience of PR and communications. And, while there were some who didn’t agree with everything Yazmin said – it would be unusual if there weren’t – all found it thought-provoking and took something from it. The three things Yasmin highlighted as the most important traits she looks for in communications professionals were the ability to think critically, understand and tell good stories, and possessing good judgement – all of which I wholeheartedly agree with. Looking around the room at the next crop of PR graduates and future leaders of our industry, I saw many already possessed these traits and with some time in the job and motivation to succeed would undoubtedly come to fill some of the most challenging and exciting roles the business of public relations has to offer. There are, of course, too many to mention individually though one did stand out – Michaella Biscomb – who showed she understood all of this, asking some tough, insightful questions of panellists and demonstrated to a room full of industry figures and potential employers that she was one to watch. While there is still quite a heated debate about the value of PR degrees, I for one am confident – based on my own experience, and what I saw at this event – that those entering the industry via the PR degree route from Leeds Business School, so long as they apply themselves, have the potential to go on to become tomorrow’s best and brightest PR minds. The event was a great success and reflective of the quality of teaching, calibre of students past and present, and the business school’s standing in the community and industry. I wish them all the best for the next 25 years, and look forward to the next opportunity to visit and speak to some of the brightest minds in PR – be they the students who will go on to be industry leaders of the future, or those teaching and providing them with solid foundations of theory, knowledge and principles upon which to build their practice and careers.